"I know that my voice has entered into the hearts of many people and has caused beautiful reactions. Some, hearing me sing, have become more religious; some who were ill felt joy; friends, while in hospital, played my tapes whenever they felt ill; they all said that my voice gave them the strength needed to stand the pain. Therefore, how can I not be thankful for this great gift?" Read a letter from Renata Tebaldi for the visitors of this site. This is a list of the roles Renata Tebaldi performed on stage and on records. This is a list of books written about Renata Tebaldi. Here are listed all of Tebaldi's recorded performances (at least all that I know of!). List of Tebaldi material on video and on DVD. Here you can read old and new reviews of Tebaldi's most important recordings. A small collection of photographs of Tebaldi in costume. Also features Tebaldi paintings! Short clips in mp3-format from Tebaldi's recordings. I have collected here some articles and excerpts from books which might be of interest to Tebaldi fans. Listen to some of Tebaldi's radio interviews. This page is dedcated to all of you. Here you can write your memories and opinions of Renata Tebaldi. Read all about the birthday cards sent to Renata in previous years. Here you can send e-cards with pictures of Renata Tebaldi to your friends. If someone has sent you a card, this is also where you can pick it up. Here you can leave any comments you might have about this site. Watch the complete third act from Aida, recorded in a 1959 performance in Paris, with Renata Tebaldi as Aida, Dimiter Usunov as Radames, and Rene Bianco as Amonasro. Click here for details on how to obtain this recording. 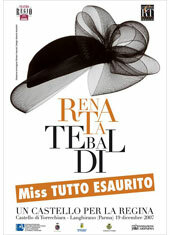 In 2010 the Renata Tebaldi exhibition will be in Trieste and New York. See www.renatatebaldi.eu for the latest details. A museum dedicated to Tebaldi in Torrechiara castle in Parma is now open. See www.renatatebaldi.eu for the latest details. Three new Tebaldi books have been published in 2008! See the Bibliography for details. 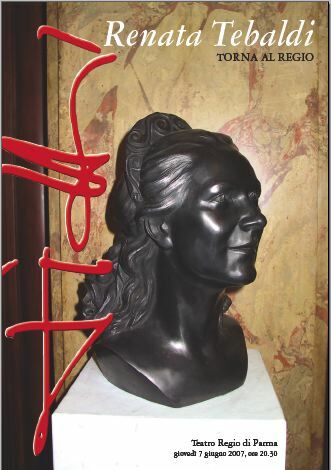 On June 7, 2007, a bronze sculpture of Renata Tebaldi was unveiled at the Parma Opera house. Click here to see a photo of it. Click the "Join now" button above to join the Tebaldi e-mail group and discuss the art of Renata Tebaldi with other enthusiasts!